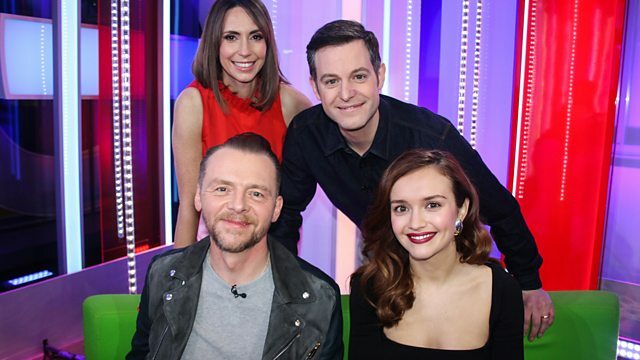 Simon Pegg and Olivia Cooke join Matt Baker and Alex Jones to talk about their roles in the new Steven Spielberg film Ready Player One. Simon Pegg and Olivia Cooke join Matt Baker and Alex Jones to talk about their roles in the new Steven Spielberg film Ready Player One. Half a century after Donald Campbell died on Coniston Water during his water speed record attempt, the show meets the man who spent over a decade recovering and restoring Campbell's Bluebird K7. Plus Anita Rani asks why the process of claiming from the Criminal Injuries Compensation Authority is so complex and Marty Jopson puts cola to an alternative use - as a household cleaner.